Baking tips, recipes, and projects shared from a pastry chef who enjoys life on the sweeter side. Sit back, read, bake, take a bite, and enjoy your passion for the sweet life! I am not even close to being Irish and usually do not become too involved in the festivities; however I wanted to recognize the holiday in the way I do it best.....with COOKIES! Below is a tutorial on how to make a simple St. Patrick's Day cookie to celebrate the day. Mix up a batch of Sugar Cookie Dough. I used the Alton Brown Sugar Cookie Recipe and added a splash of vanilla. Roll out your sugar dough on a lightly floured surface to between 1/4 and 1/2 inch. Try to roll it nice and even so all the cookies are the same thickness. Using circular cutters, punch out the dough. I used two different sizes. If you don't have cutters you can use the top of a glass to punch the dough out instead. The cookies were still pretty chilled when I cut them out so I did not put them in the fridge to chill before baking. Bake the cookies at 350 for about 10 minutes. The baking time will vary depending on the oven you are using so keep an eye on them. When the cookies are done they should start to have a slight browning around the edges. 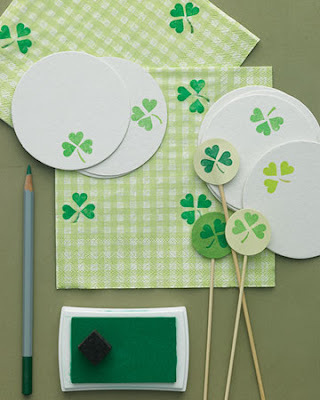 I found this simple design idea for the cookies from this St. Patrick's day craft project on the Martha Stewart website. The simple stamped clover looked like a quick and cute cookie to celebrate the day. When drawing the outline, squeeze the bag with a small amount of pressure and slowly move the icing around the outer edge of the cookie. Notice how I'm holding the bag about an inch above the cookie. This allows the icing to fall nicely into place in a smooth line. Holding the bag against the cookie will make it very hard to make a smooth line and will squish the line instead of allowing it to fall in the shape of the tip. Continue all around the cookie. Repeat with all the other cookies you will be decorating. Make sure the icing makes a complete circle so that it will hold the icing you will be filling it with. After the outline has dried, prepare your royal icing for the fill technique. Add small amounts of water and mix together thoroughly until you have a consistency that slowly melts back into itself. Notice how the icing has no remnants of the icing I was dropping into it in the previous picture. This means that the icing will make a smooth surface on the cookie. If you make the icing too loose, it might be a little harder to fill the cookie and take longer to set. If it is too thick, it won't spread easily to a smooth finish. You can put the flooding into a squeeze bottle if you have one on hand. I didn't have mine with me so I simply spooned a small amount onto the cookie. I then lifted up the cookie and shook it to help spread the icing to the edges. I used the end of my paint brush to help fill the last areas of cookie that were still showing. Let your cookies dry for at least an hour before painting on the design. After an hour these cookies will still not be completely dry so avoid putting pressure on the top of the cookie. They are dry enough to lightly paint the design on the top. If you are worried about damaging the cookie then you can let the dry overnight before attempting to paint them. I mixed green luster dust with a small amount of lemon extract to make the paint. You can order luster dust online or find in at your local craft store. I often use rum to make my edible paints; however the lemon extract gives the cookies a nice hint of flavor. If you don't have these items you can try using gel food coloring; however, the drying time maybe longer. With a thin paint brush, paint a heart on the cookie. Set the cookie in the position that is easiest for you. I found it to be easier for my to paint on the cookie when I am always painting on the 'top' of the cookie. After I painted the first heart I rotated the cookie to the left so the 'top' space was free for me to paint the next heart. Rotate the cookie again and paint the last heart. I decided to make three leaf clovers like the Martha Stewart design but you could easily make these into four leaf clovers. To finish the design simply make one brush stroke for the stem of the clover. Let the cookie dry overnight if you want to package or stack them. It really takes a long time for the icing to settle and you don't want to rush and damage all your beautiful work! Or you can eat them right away and wash the down with some Green Beer! To make the criss cross design, I simply painted straight lines across the cookies in two directions to create the mimic the pattern on the Martha Stewart napkin. A strong passion for baking blossomed out of all the incredibly sweet moments she shared with her Grandma in the kitchen throughout her childhood. After earning her bachelor's in business, Gabrielle pursued this passion by completing the Pastry Arts program at the French Culinary Institute in NYC. Gabrielle has worked in various bakeries in the NYC area and has brought her sweet vision to life with her specialty cake & pastry business GoBoulay. Through this blog Gabrielle will share recipes, techniques,projects, and tricks of the trade. So sit back, read,bake, and take a bite, and enjoy your passion for the sweet life! How To make Filled Cupcakes!